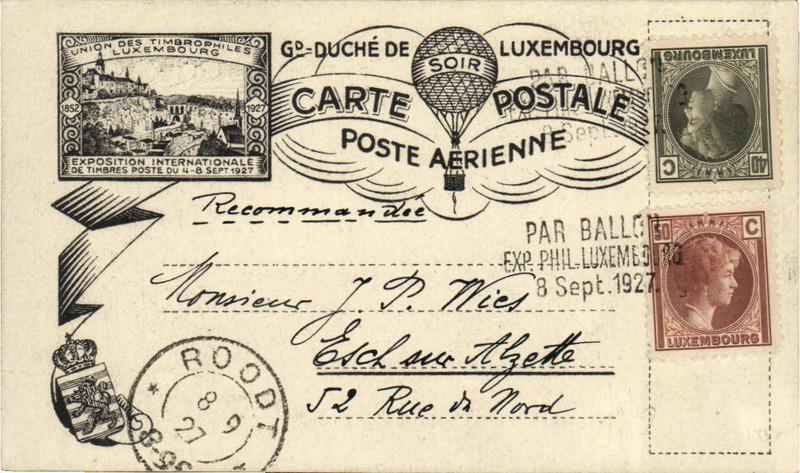 First balloon flight from Luxembourg, bs Roodt 8/9, franked 50c + 40c stamps, posted at Int. Stamp Exhibition. 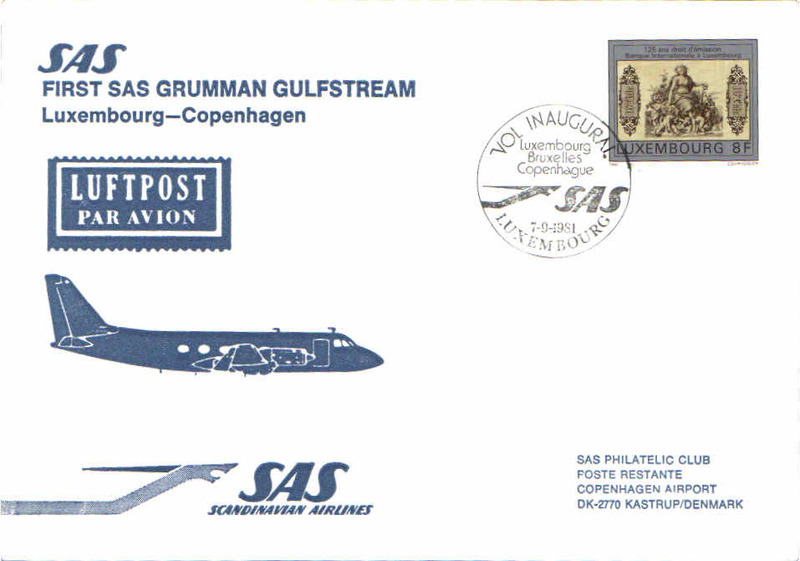 Aerophil Expo, special flight Diekirch to Brussels, bs 18/7, registered (label) cover franked 4F. 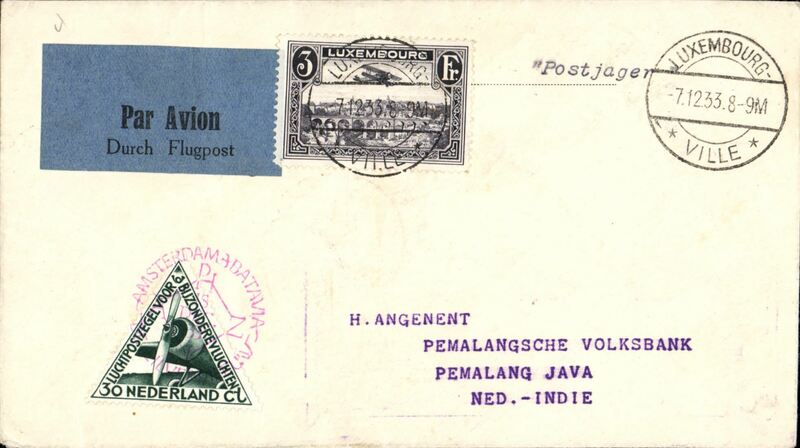 Luxembourg acceptance for the special Amsterdam-Batavia flight, bs Palembang 23/12, via Brussels 7/12 transit cds verso, franked Luxembourg 1931 3F air canc 'Luxembourg/7.12.33/Ville' also 30c Netherland triangular stamp tied by red Amsterdam-Batavia cachet, and typed 'Postjager'. Scarce Luxembourg acceptance for the Belgian Congo, for carriage on the first regular Sabena Brussels-Leopoldville service, Luxembourg to Elisabethville, 18/3, via Leopoldville 28/2 (and return, see later), Maury Swartz etiquette cover franked Luxembourg 1931 1F and 50c airs and Belgium 2F air and 35c, 15c ordinary, all canc Luxembourg Ville 20/2/35, typed "Raid Belgique-Congo par l'avion Edmund Thieffrey", red French/Flemish boxed "1ier Depart Sevice/Aerien Regulier/Belgique-Congo" flight cachet applied in Brussels. Returned to Brussels, bs 8/3, on the return flight in error, almost certainly the result of confusion caused by the mixed franking, eventually arriving in Elisabethville on 18/3, by way of the second Brussels-Congo, and an internal Sabena flight. 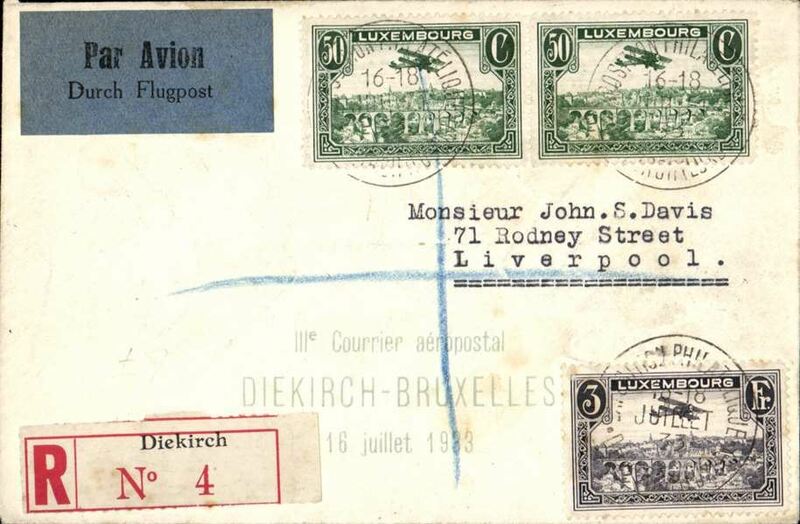 Very few items sent from Luxembourg; this 'round trip' cover may be unique. Ex Clowes. Luxembourg acceptance for F/F accelerated Air Afrique connection Algiers-Elisabethville, Luxembourg to Elisabethville, bs 17/6, via Brussels 11/6, commemorative card with diagram of route dual franked with Luxembourg 50c and Belgium 3F30, blue framed "1er Service Aerien/Francais Directe/Europe-Congo-Madagascar/par Stanleyville" cachet on front, and red framed "1er Service Aerien/Francais Directe/Europe-Congo-Madagascar/par Stanleyville" cachet verso, dark blue/black 'Par Avio/Durch Flugpost' etiquette. 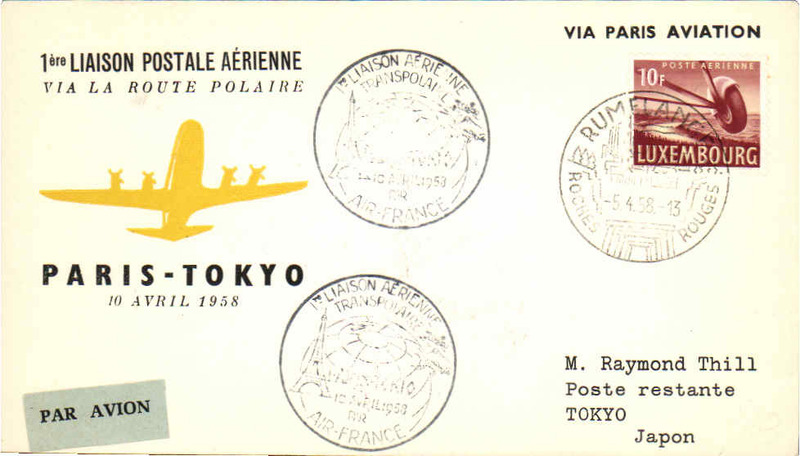 Luxembourg acceptance for F/F over polar route, Paris to Tokyo, cachet, b/s, souvenir cover, Air France. Luxair F/F Luxembourg to Yugoslavia, Split arrival ds on front, souvenir card, flight cachet. Light even toning. Lunar, F/F Luxembourg to Split, cachet, b/s, souvenir cover. Luxair, F/F Luxembourg to Athens, cachet, b/s, souvenir cover. Luxair F/F Luxembourg to Malaga, arrival ds on front, souvenir cover, flight cachet. 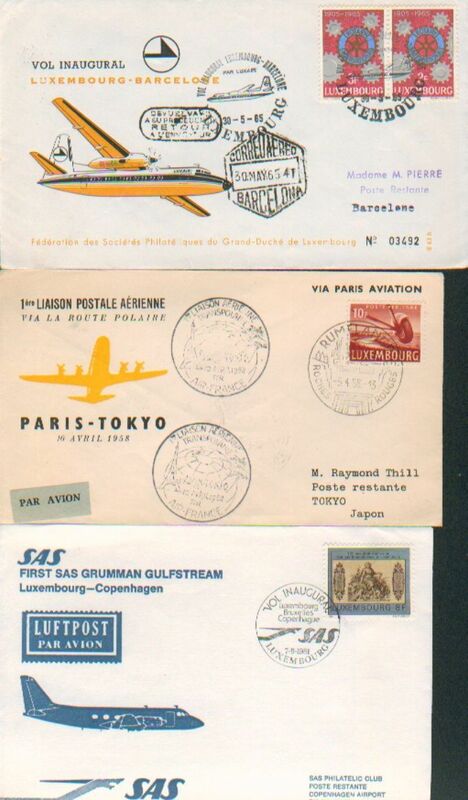 F/F Luxembourg to Amsterdam, cachet, b/s, souvenir cover. 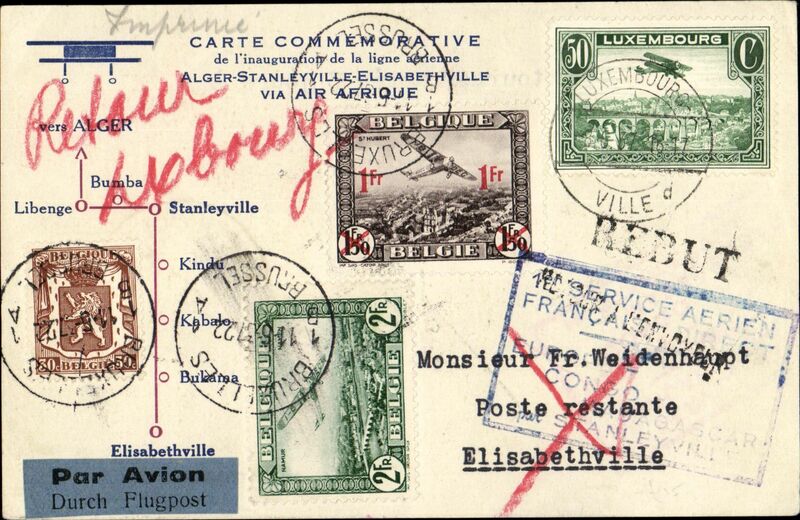 F/F Luxembourg to Geneva, cachet, b/s, souvenir cover. Loftleidir, F/F Luxembourg to Chicago, cachet, bs, souvenir cover.